Partnerships in business aren’t easy, far from it actually. As we (Sergio and Gilberto, the interviewers) walked into Elegant Designs for our next interview, it became evident to us that the dynamic between Armando and Donnie, co-founders of Elegant Designs, was special. In rare occasions, we come across relationships that immediately protrude with positive vibes and Armando and Donnie's is one of them. We had the pleasure of speaking with the partners both individually and together at separate times, which made the interview that much more interesting and powerful. First up, we spoke with Armando Ramirez, "the visionary" as his partner Donnie calls him. Armando told us briefly about his personal beginnings, which sparked the beginning of Elegant Designs. "When I was a teenager, I would create floral arrangements and sell them to whoever wanted to buy them. I always had a passion for creating and for selling". Originally from Aguascalientes, Mexico, Armando told us that before coming to the United States, he had an event planning business in his native country. "I wanted to come to the U.S., save money and go back home to start a bigger business", Armando told us. But after coming to the States for a second time, he was convinced that the United States was the place for him to be, that Elkhart County was the place for him to be. In 2001, Armando met Donnie, without knowing what would come of it, Armando shared the idea of wanting to start a business having to do special events, and that is where it all began. "Elegant Designs began as a special event decorating company but both Armando and I had a real passion for helping ladies of all ages find the perfect dress". Donnie shared with us that when Elegant Designs first started; both Armando and he were working other jobs full-time and working toward building up their business at the same time. "It was tough", Donnie said, "but we both had a dream and we weren't going to give up on it". In business, many partnerships have failed, it is a common occurrence. In the case of Armando and Donnie however, starting a business as partners meant they always had someone to lean on, they always had a source of encouragement and motivation, and rather than creating distance between them, Elegant Designs made this partnership incredibly strong. "I am inspired by the smile on our client's faces when they find the perfect dress, I am inspired growth and opportuntity but most importanly, I am inspired by my partner". At separate times, without one another being in the room, we asked Armando and Donnie, "who or what inspires" and it ultimately it came down to them saying their biggest source of inspiration is one another. "Being in a partnership challenges you to grow at a more rapid pace because if you want to be a good partner, you compromise, you learn to understand your partner's perspective, you learn to agree to disagree and that isn't always easy", Donnie told us. "As a business person, always be willing to re-invent yourself". Our time with Armando and Donnie was refreshing and inspiring. We feel very grateful to be able to hear these wonderful stories and be able to share them with all of you. For all the aspiring entrepreneurs and current business owners, in the words of Donnie, "never give up on your dream, no matter how tough times may get". 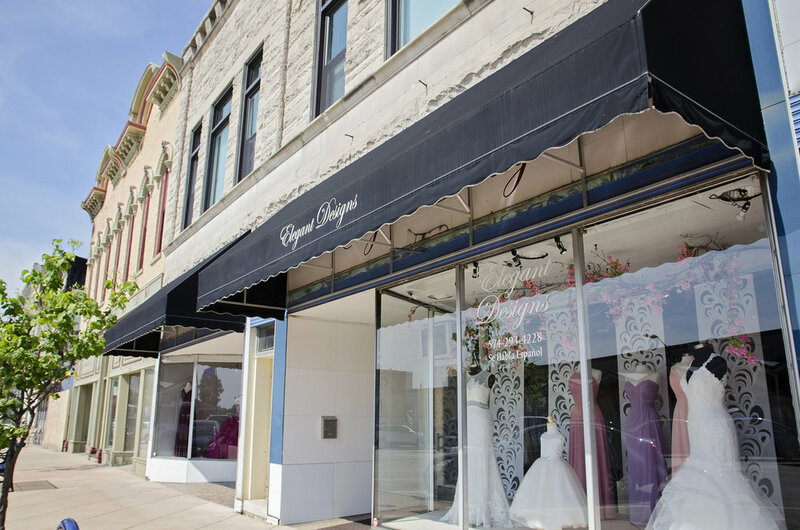 Elegant Designs has been doing business out of Downtown Elkhart since 2005 and growing steadily every year without any signs of slowly down. The dream is alive and well, till next time, friends. The Latino Entrepreneur Story Writing Project is sponsored by the Center for Intercultural and International Education at Goshen College.